I considered a number of veils and tried on a few in bridal salons before I chose a mantilla. I decided that a lace mantilla would give me the vintage look that I want as well as compliment my bridal look and my facial features. Originally, I wanted an all lace mantilla, but after looking at lace for MONTHS all over the Bay Area and Northern/Central California as well online, I couldn’t find what I wanted, so I opted to go with my second plan, which was to have a mantilla with a lace edge. If you’ve looked at veils, you know that they are enormously overpriced, which is mostly because most of them are made from nylon tulle (or illusion) which is really inexpensive. I did a lot of research when choosing my veil material and had wanted to go with silk tulle, but at $75-$300 a yard, I wasn’t exactly certain I was prepared to work with it, especially considering how fine and delicate silk tulle is and that it is fragile and disintegrates over time. 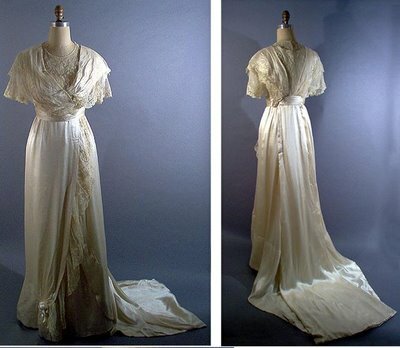 I found out that during the Edwardian era, many brides weren’t able to find (or afford) silk tulle and used English cotton net as a replacement material, and as my wedding dress is kind of a late Edwardian style, I decided that English net would be perfect for my ensemble. English cotton net is hexagonal and has a similar drape to silk tulle, but more opaque (this is a great site for explanation of veil fabric Vintage Wedding Veils ). It is not very easy to find and most of what you’ll find is MOCK English net, which is polyester. I didn’t want any synthetic materials in my veil as I want my veil to be an heirloom veil and I want it to last. Proof that synthetic materials aren’t the best way to go is by looking at my grandmother’s nylon net veil from 1946 and how it has many rips in it when it’s been stored in a box for 64 years. Plus, the nylon became very stiff over time and looks nothing like her wedding pictures. So if you’ve decided on English cotton net for your veil, be certain to read the materials and ensure that it’s not made out of polyester. I found my English cotton net online at Heirloom Sewing for Children. 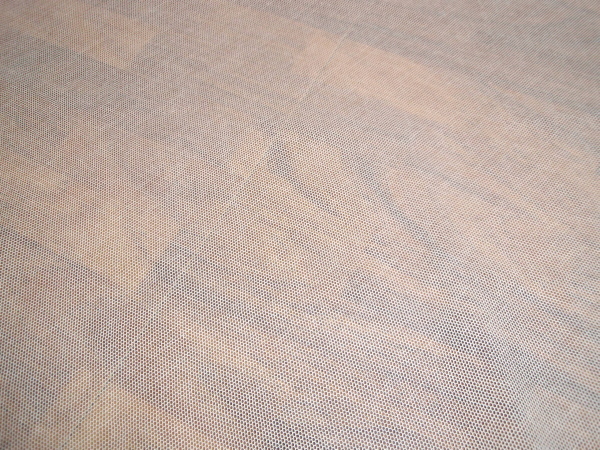 They also have a Swiss cotton tulle netting available which is finer than the English net. I wanted my veil to be vintage looking, so I chose ivory as my color. 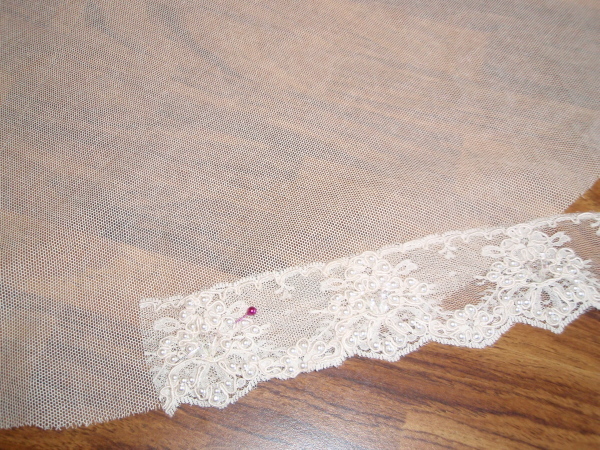 I decided on Alencon lace for my veil edging and purchased my lace from Britex Fabrics. Britex has an excellent collection of lace at their store in San Francisco and I had looked there a few times for my mantilla lace. I actually found the one that I wanted on their website, which is a 2″ French pearled Alencon lace with Aurora Borealis sequins imported from France. I have to tell you that I LOVE ordering from Britex, and have since been ordering silk ribbon and edging lace for my dress. It comes wrapped perfectly and they ship it very quickly. It’s also much nicer than having to drive into SF to get it! Now only if Lacis in Berkeley had such a service as well as such nice CUSTOMER service (which they do NOT). Now that I decided on my veil materials and have them in my hand, it was now time to make my veil! First, I cut out a piece of muslin the same size as my English cotton net so that I could figure out how large I could make my mantilla. The English net is kind of narrow, so I couldn’t make a huge circle and instead made an oval pattern. 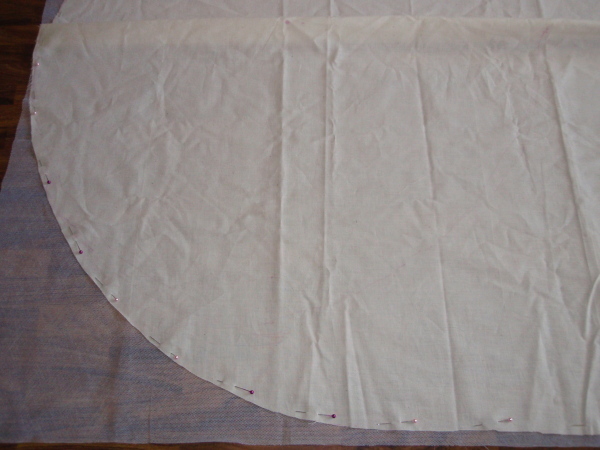 I pinned my muslin pattern on the English net and cut it out very carefully, which was probably the easiest part of this process. The English net that I bought was white as I wasn’t certain how dark the ivory would be (no samples!). I solved this by tea staining the material, which was easy to do as I’m using cotton and not a synthetic material. I’m not sure how nylon or polyester do with tea staining, but cotton, as a natural material, takes the color very quickly. I had to be careful with the cotton though, as it stretches and wanted it to keep it’s shape. I can also iron my veil material, which isn’t something you can do with nylon. 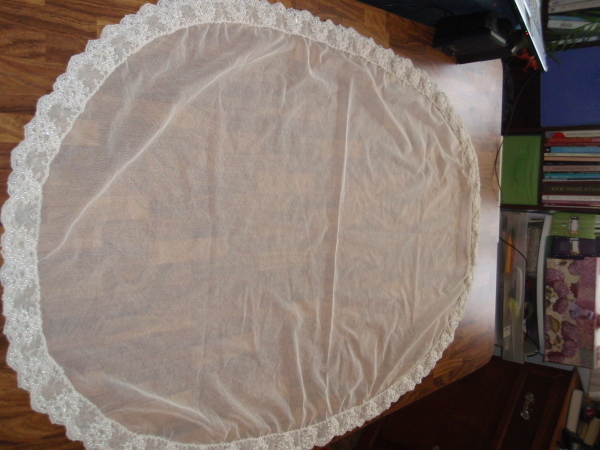 Next, I pinned my Alencon lace on the English cotton net of my veil, starting at the center bottom and working my way around my veil. 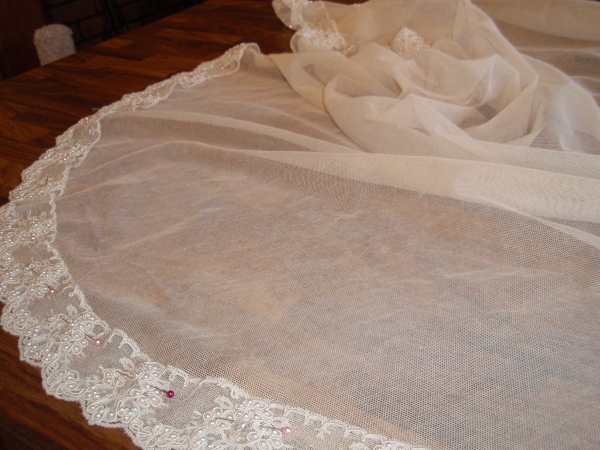 The tea stained English net went beautifully with my ivory French Alencon lace and I hid the edges of the net in the lace border. 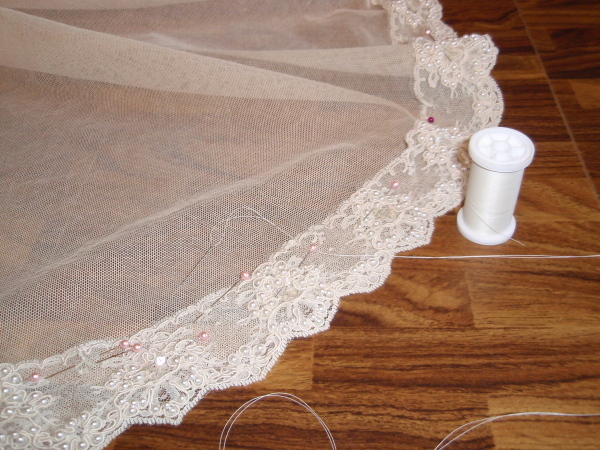 Next, I sewed the lace on by hand with thread that matched my veil. I considered using clear thread, but decided that matching thread would work better. My veil is hand sewn due to the Alencon lace and the pearling, but as painstaking a process as this is, it looks much better than it would if it were sewn by a machine. By hand stitching, I was able to camouflage my stitches and they basically disappear into the lace. 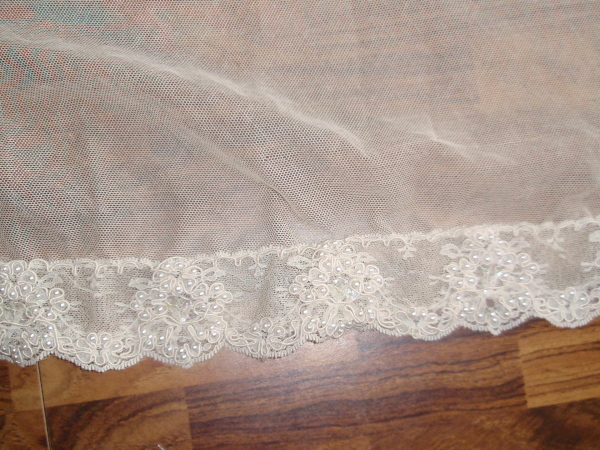 I first sewed the top edge of the lace, removing the pins as I went along, and then sewed the bottom. 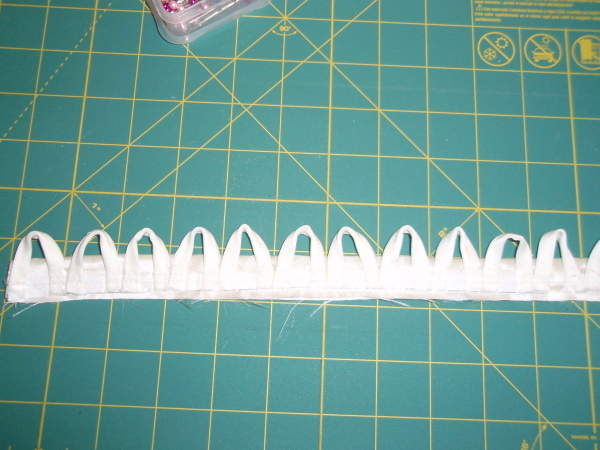 I also reinforced some of the beading that was a little loose as I went along. Originally, I had wanted to take the sequins off the lace, but they are sewn on (by hand) with the pearl beads and to remove them would mean that I’d basically have to re-bead my whole veil…. The hand sewing took me two days to complete, so it is not an easy or quick process, but once I was done, I was very happy and proud of my work. 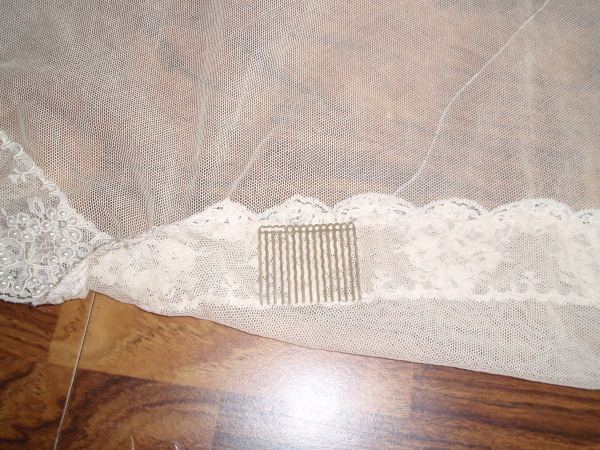 After completing my mantilla, I sewed two combs on in order to hold it in my hair. These are silver combs I found on eBay, and ended up being perfect for my veil. I have thick, curly hair, so there won’t be a problem attaching these on my wedding day. I sewed my combs at the crown of my veil about where I thought they’d work best. 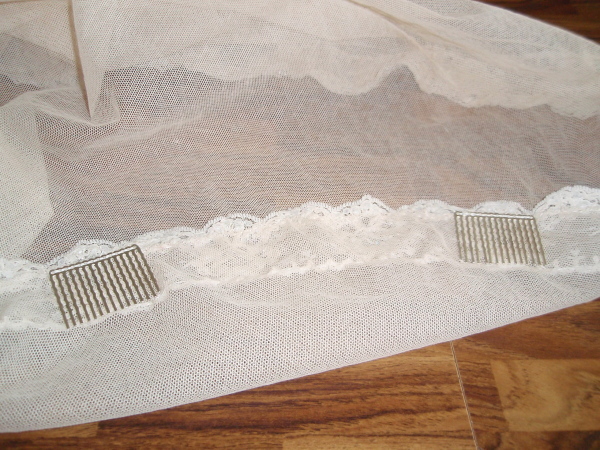 I used the same thread that I sewed the lace on and hid the comb stitches into the lace. I double reinforced it and that seems to work well, but I can always go back and triple reinforce it if I think it needs it. My mantilla is fingertip length. It also needs to be ironed (there are not all of those creases in it! ), but as the English net creases and wrinkles very easily, I’ll probably wait to do that until my wedding day. For now, I’ll be folding it and wrapping it in acid-free tissue paper and storing it in a box until the big day. One more project out of the way! I’ll post a pic of me wearing my veil at a later date when I get my hair all dolled up for the “pre-show”. I think I gained the vintage look and feel that I was looking for and created an heirloom veil that I hope that any daughters/granddaughters that I might have in the future will consider wearing. oh my gosh Tanya its soo unique and still cant believe you did it by hand.. :)…. its totally gorgeousss… im soo excited… :)… your veil is not only stunning but beautiful :).. Thank you, Ola!! I cannot wait to wear it! Thank you so much for this! I’m planning on making my own mantilla veil as well. Do you have the dimentions of your veil? It beautiful!!! How many yards of lace did you use for the veil? This is so beautiful! I’m currently looking for combs for my mantilla veil, and I’d love advice on where to look – it sounds like you were happy with the ones you got from eBay? I also want to make sure my veil remains an heirloom, so I don’t want to skimp on quality, and so often shopping on the internet feels like a guessing game! I would recommend silver or silver plated combs. I purchased my last ones on etsy.